At this year's Blizz Con, Overwatch director Jeff Kaplan entered an arena filled with roaring fans to announce two new things: an animated short named "Reunion," which focuses on McCree, and the game's 29th hero named Ashe, who throws down with McCree in the animated short. 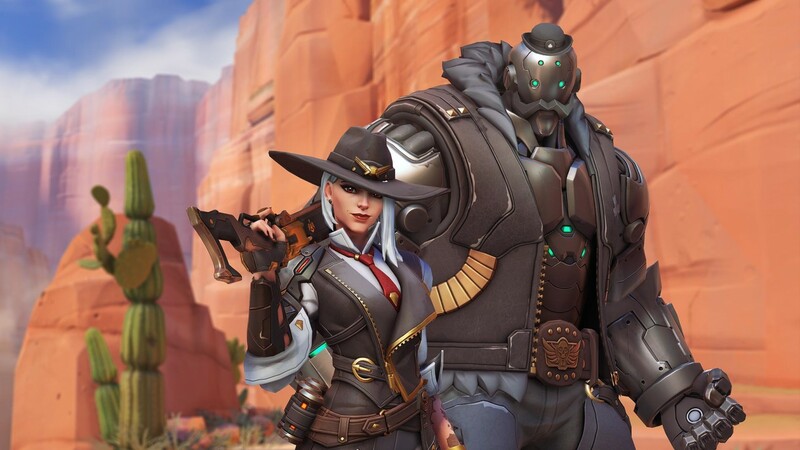 Ashe is unique in that she is joined by a robot named B.O.B. That's right, B.OB. can be summoned mid-battle as an ultimate. Ashe appears to be a mid-range DPS hero who can snipe enemies from afar and use the sheer force of her gun to propel herself high in the air. She can also throw dynamite to take down threats close range. When Ashe activates her ultimate, B.O.B. runs into the fray, uppercuts foes, and can mow down more of them with his arm, which transforms into a chaingun. We don't know how long B.O.B. will be on the battlefield, but he looks like he can deal serious damage. No announcements were made regarding when we can see Ashe in the game, but if Blizzard holds true to the most recent hero reveals, she should be entering PTR on PC in the coming weeks.